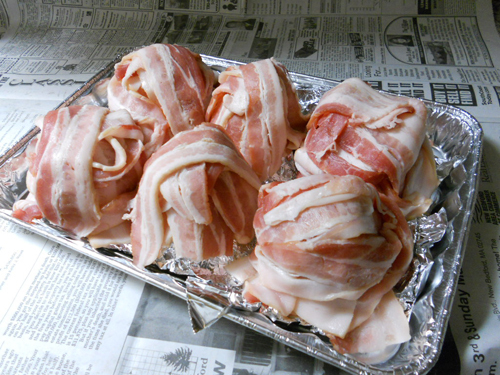 I’ve wanted to make bacon baskets for quite some time, but figured my Mom wouldn’t want me making them for a couple of reasons. 1) What if the bacon grease catches fire in the oven? 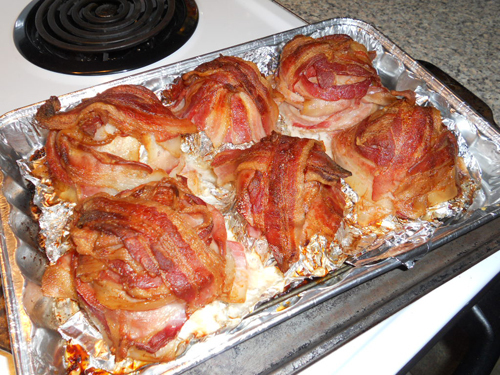 2) What if you mess up and waste all that bacon? Bacon is expensive! – Bacon. And a lot of it! – Whatever you want to put in the baskets. Like salad. Or mac&cheese. – Preheat oven to 400 degree. 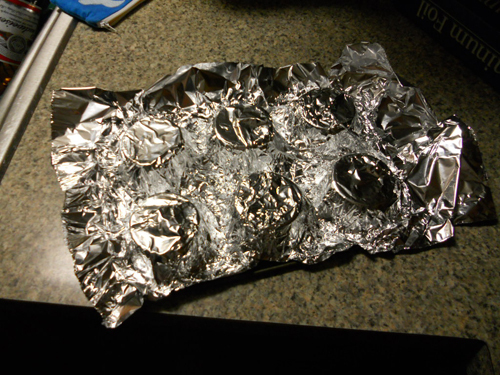 – Wrap aluminum foil around the cups of a muffin pan. 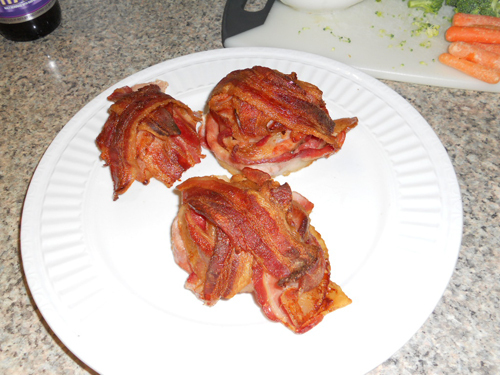 – Weave the strips of bacon around the muffin cups like you’re making a basket. Because you are! – Place muffin pan in or on another pan, to catch the grease. – Cook until done. 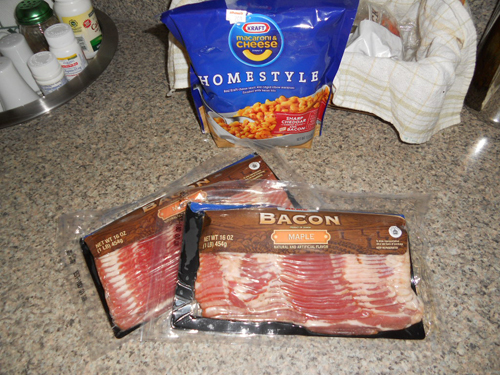 Now this is where I ran into the problem because after an hour, I just wanted the bacon be to done. And it definitely LOOKED done. But it wasn’t done. In retrospect, I should have looked up a cook time. Then I would have known that it takes about 3 hours. Not 1 hour. When I turned them over… Just, yuck. It looks like it just came off the pig! Needless to say, these did not get filled with food. And they were TINY! Who wants to eat in tiny little portions? Not an American, that’s for damn sure! Next time I’m going to try wrapping the bacon around a medium-sized bowl. And fully cooking it. Too much work. I’ll just fry my bacon in a pan and not shape it fancily. And salad in a basket made of bacon?! That’s just wrong. So very wrong. 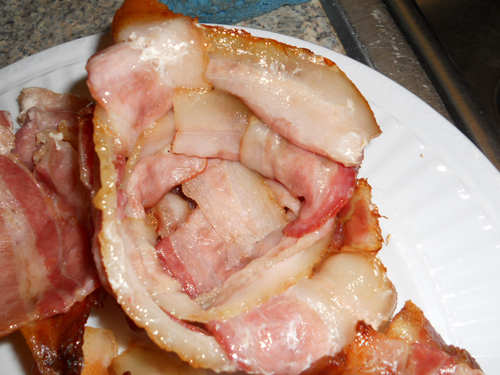 This shows what should go in bacon: http://recipes.wikia.com/wiki/Bacone. Even more way too much work though. I think mac and cheese would be good too. That bacone looks pretty good, but if you put your salad in a little bacon basket, you could just pick it up and eat the whole thing! Salad+bacon on the go, for the working girl. Or something clever like that.